What a great time to be planning a kitchen remodel or building a new home! Technology has made the kitchen of tomorrow, a reality today! From French door ovens to dishwashers, refrigerators and microwaves with trick pull out drawers, today’s kitchens are stylish and functional! Home automation and smart appliances have found their way into today’s trendy kitchens. Updated appliances with cool new features and finishes are coming out all the time. My friend was telling me about the great deal on their energy bills they got from Simply Switch. She tells me she saved so much money! Whenever time permits, I’ll update this page to highlight some of the latest gadgets, gizmos, news, tech and trends. 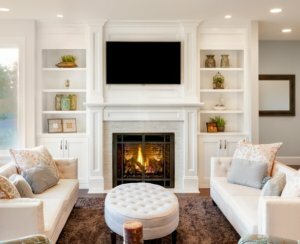 Wondering what home trends are hot in 2018? The results are in from a recent survey of designers conducted by the National Kitchen & Bath Association (NKBA) to reveal the key design trends for 2018. The results of the NKBA 2018 Kitchen & Bath Design Trends Survey confirmed the continuation of a number of existing trends in the marketplace, but also uncovered others that indicate shifts in the direction that kitchen and bath style will take this year. Below are some of 2018’s hottest kitchen bath trends. 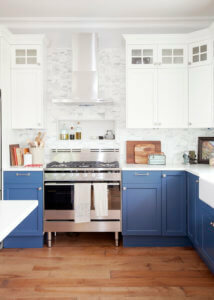 Kitchen cabinets with different colors on the uppers and lowers are very hot right now. We’re seeing lots of blue/white and grey/white combinations. Mixing painted uppers with stained wood lowers is also a unique look. We’re seeing additional plugs, hidden power strips, and lots of USB charging ports in our latest kitchens, to keep all the latest tech charged and ready for action. Home automation and smart appliances continue to grow in popularity, as well. The trend in kitchen wood seems to be heading toward the lighter woods like quarter sawn white oak. Bleached woods are also popular. Conversely, the darker black walnut has remained incredibly popular for cabinetry, too. Appliances in new finishes like black stainless are gaining popularity as we’re seeing a chunk of the market move away from the obligatory stainless finish. Refrigerators with a peek-inside feature are growing in popularity, as well as super cool looking French door ovens. If you are looking for a new refrigerator you might want to check out somewhere like howtohome.com/kitchen/best-refrigerators-no-freezer/. 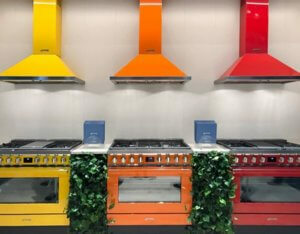 Bright colors were all over at the KBIS show this year–vividly colored sinks, faucets, appliances, range hoods and even boldly colored cabinetry could be seen throughout the event. There is no hiding these vibrant appliances and fixtures! Almost completely, incandescent lighting has went the way of the Dodo. LED lighting is now the standard for under cabinet lighting, as well as ambient lighting and cabinet interior task lighting. We’re seeing toe kick lighting and cabinet interior lighting becoming more mainstream. It is exciting to see more and more Crestron Home Automation as well, making kitchens feel more futuristic than ever before! Steam ovens, induction cooktops, and sous vide cookers continue to gain popularity. In a steam oven, combining steam with a convection oven, food cooks quickly without the need of added oils and fat to keep the food moist. Induction cooktops heat by magnetic induction, in lieu of the traditional flame or electric element. With induction cooking, a pot of water can be brought to a boil in about 3 minutes…that’s twice as fast as a traditional electric or gas cooktop. Brass hardware is expected to be on trend this year. Satin and brushed brass finishes are beautiful choices for both plumbing fixtures and cabinet hardware. Quartz continues to take away market share from granite in the market for bathroom vanity tops and kitchen counter tops. Some of the new quartz colors are dynamic and stunning! We’re seeing lots of quartz used on shower dams, cubbies and shower seats, too. Freestanding tubs are still growing in popularity in larger bathroom suites. We’re seeing lots of younger customers opting out of a tub entirely, opting instead for an oversized shower. Multiple shower heads, jets, seating areas and tons of storage are on trend. We’re seeing increased demand for tubs, showers and benches to be located within a single, dedicated wet zone in new construction and bathroom remodels. 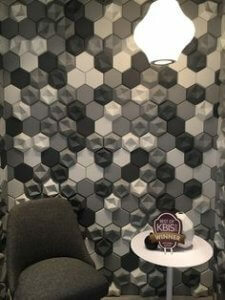 Boldly patterned tiles and tiles with a 3D element are hot right now. Tiles with a wave pattern or a symmetrical three-dimensional element are a great way to add some funky textures to your new bathroom. Fun shaped fish scale or mermaid tiles can make quite a statement, too. Mediterranean inspired tile shapes and patterns are super cool and very trendy!